Gold wedding bands or rings are the standard for wedding bands. They are classic and simple. This traditional wedding band can be worn by men or women, and can be plain or ornate. There are many styles available, and prices can vary widely, but if you know what you are looking for you can find the perfect ring, or set of rings. Gold bands can be worn by men or women. Some styles of gold rings even come in a unisex style that is simple or plain enough to be worn by either gender. Gold wedding bands also come in his and hers sets, where the rings match each other, but are different widths. The bride’s ring is slender and feminine, and the groom’s ring is wider and more masculine. There are many style choices for gold wedding bands. They can come in a plain band that is smooth and shines, or a more muted or frosted look. They can also come in various textures, made to look like wood grain or woven ribbons. Gold rings can also come with designs etched onto them, such as diamond shapes or hearts. Diamonds can also be embedded into a gold band, instead of the raised diamond that is typically seen in wedding rings. There are two types of gold to choose from, white gold and yellow gold. Yellow gold is the more traditional choice, though white gold is also popular. Rings can also be a mix of white and yellow gold, or a mix of gold and platinum, intertwined in a design. The price of a gold wedding ring partially depends on how many karats it is. The measurement of karats is a measurement of how much of a percentage of the ring is pure gold. It is measured in 24ths. The smallest amount that can be legally called “gold” is 10 karats, or 10/24, which is 41.66% pure gold. The most common karat measurement in rings is 14 karat gold, or 58.33% pure gold. There is also 18 karat gold, which is 75% pure gold. The higher the karat, the more expensive the ring is. The price of a gold wedding band can range from $100 for a simple 14 karat gold band to over $3000 for an 18 karat gold band with a more complex design that involves embedded diamonds. Most rings will fall into the range between $100 and $700. There are many places to buy gold wedding bands, from jewelry stores in your area to online stores. If you’d like to see the ring selection in person, or find the right size, going to an actual store is the best idea. However, online jewelry stores can be less expensive than brick and mortar stores, and have a greater selection to choose from. Before choosing an online store to purchase from, do your research. Read reviews of the store to make sure they are completely legitimate. Check out their warranty and returns policies. If necessary call their customer service number with any questions you may have. It’s important to find the right size for your wedding ring. There are methods of measuring your own ring finger using string or a piece of paper, but this is more prone to error than having the size determined by a professional. Many things influence the size of the fingers, such as temperature or water retention. Ring size may change throughout the day. You may want to measure at different times and then take the average of all the measurements to be the size you need. A professional jeweler, however, may understand these variations better than a lay person and be able to choose a size more accurately. Gold and platinum are the two most popular wedding ring materials. Platinum is the strongest precious metal used in jewelry making. It is more durable than gold, which is beneficial in wedding rings because they are worn daily. Platinum is much more expensive than gold, however, making gold the better choice for anyone with a smaller budget. Even though gold is not as durable as platinum, it is still very durable. If durability is a factor, 10 karat gold is more durable than 14 or 18 karat gold. 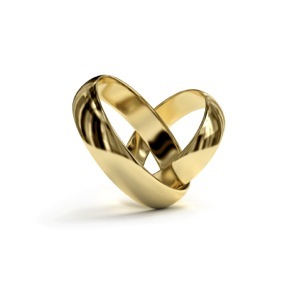 Gold wedding bands are a beautiful and timeless way to symbolize a marriage. With the variety of styles, color combinations, and prices, any couple is sure to find a set of rings that they will love.